Lower back pain can often be the result of stiffness or restriction elsewhere in the body – particularly the hips or the thoracic spine. 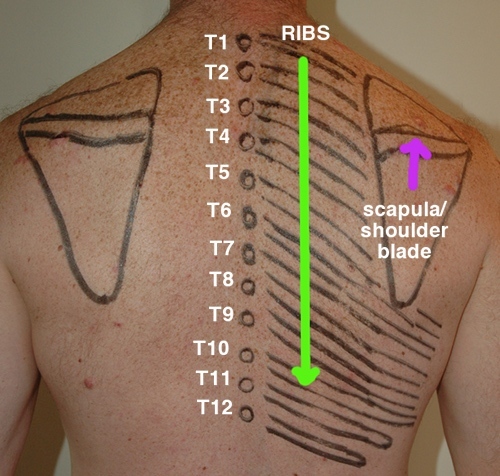 The thoracic spine is effectively your mid back T1 to T12 below. Often the thoracic spine becomes stiff because of too much sitting postures – which causes this “kyphose” or slumped posture which often goes hand in hand with a shortening of the deep hip flexors which attach the lower back to the front of the hip. If you restrict movement in the thoracic spine then you will restrict movement in your hips – this is because if you are unable to lift up through your chest because of this slumped posture then you will invariably arch your lower back to get the required extension. What happens then is that the front of the hips become tighter and tighter because the arch in the lower back becomes more pronounced. What this effectively does is to bring the attachments of the deep hip flexors closer together and the muscles then become shorter. 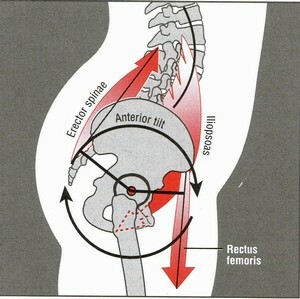 Why does a stiff thoracic spine restrict my hip extension power? If the thoracic spine becomes slumped/dropped then, as a compensation the lower back has to arch otherwise we would fall forwards. 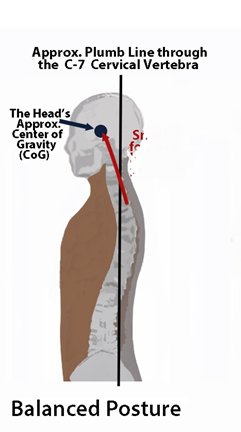 In the second picture there is more of the thoracic spine behind the center of gravity, thus the compensation is that the lower back has to arch to come forwards of the line. 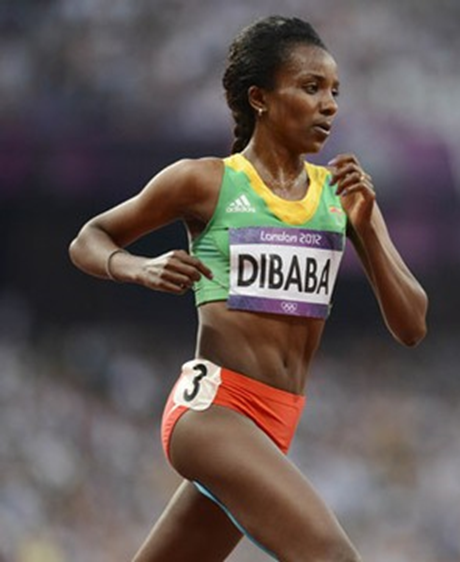 The arched lower back “tightens” the front of the hips via the hip flexors – this causes us to then run with flexed hips – if you are overtly arched in your lower back then generally the hips may well remain in hip flexion whilst you are running. The tight hip flexors do not allow the glutes to work powerfully as they should do when you run – this means that the body has to think of how to get from A to B the quickest and easiest way it can. The body does not care about what is good movement – it will cheat and steal and get it in the most convenient way possible. As such the body then forgets about hip extension and the powerful glutes and uses the quads and calves for propulsion which eventually may manifest itself as regular calf strains, lower back pain or pain in the front of your hips. (look at the rotation to the right in the thoracic spine as the pelvis rotates to the left) The other way a stiff thoracic spine affects the “power producing capacity” of your hips is in the rotational plane of movement. 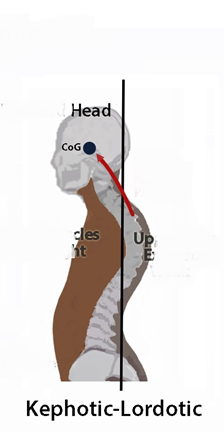 If the thoracic spine cannot rotate freely around the long axis then your stride will become shorter – if you look at the running cycle – as you push off from one leg you will notice that the upper body rotates in the opposite direction – this creates torque and allows for full hip extension. If you cannot rotate through your upper back then you will be unable to express full hip extension – again negating the power available in your big engine – THE BUTTOCKS. Now if we think about your abdominal muscles – they work in a very narrow length tension range – what this means is that imagine your abdominals are a fence between two gardens – if you go an inch one side of the fence and you are into next doors garden – come the other side by an inch and you are back in your own garden. For the abdominals to work effectively – they need to sit right on the fence. SO – if you think about where your abdominals attach – they attach from your rib cage (which is attached to your thoracic spine) and the front of your pelvis.